Kinectrics’ QA Program is designed to meet the requirements of several quality standards; this provides the roadmap that allows Kinectrics to execute work for a wide variety of customers and applications. The program is designed around customer focus, project management methodology, and a culture of continual improvement, which can be customized to the needs of each project to ensure an appropriate level of quality management. Supporting technical work is controlled through documented procedures. Quality is maintained through regular review, independent verification, and frequent internal audits. Customers, regulators, or other stakeholders may review Kinectrics’ QA Program at any time. 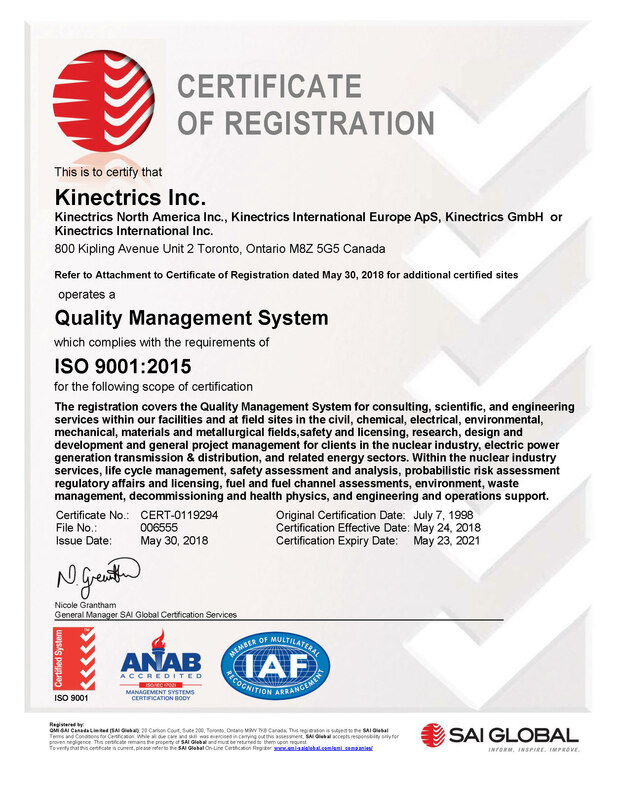 Kinectrics QA Program complies with ISO 9001:2015 and is registered by SAI Global. For Kinectrics’ Canadian and CANDU customers this program also meets the requirements of CSA N299.1-16, CSA N286-12, and CSA N286.7-99. For Kinectrics’ U.S. nuclear customers the QA Program meets the requirements of 10CFR50 Appendix B, 10CFR Part 21, and ASME NQA-1-2008 with 2009 addenda. 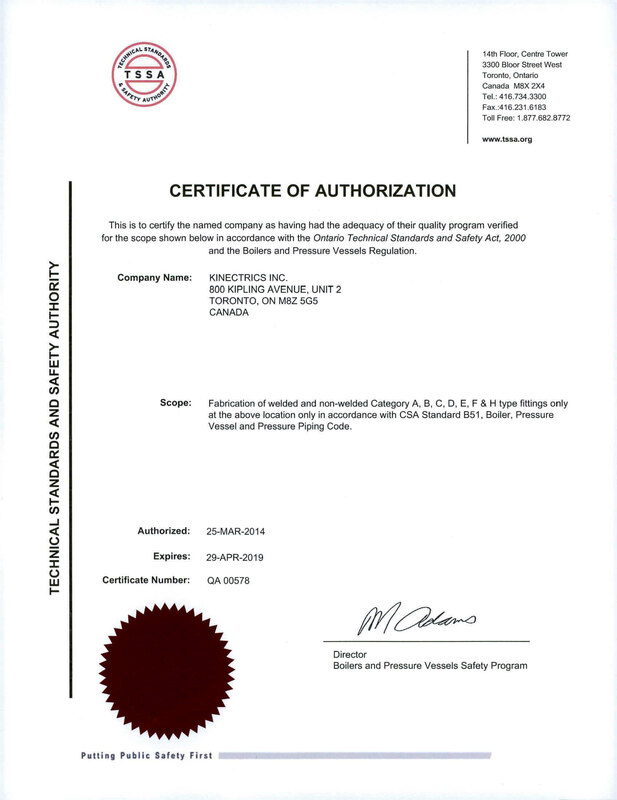 Kinectrics’ also holds several Certificates of Authorization from the Technical Standards & Safety Authority (TSSA) for pressure boundary work, including CSA B51 design registration, and CSA N285 construction, repair, and modification of fittings; construction of supports; construction of vessels, pumps, line valves, and piping systems; and material supply. 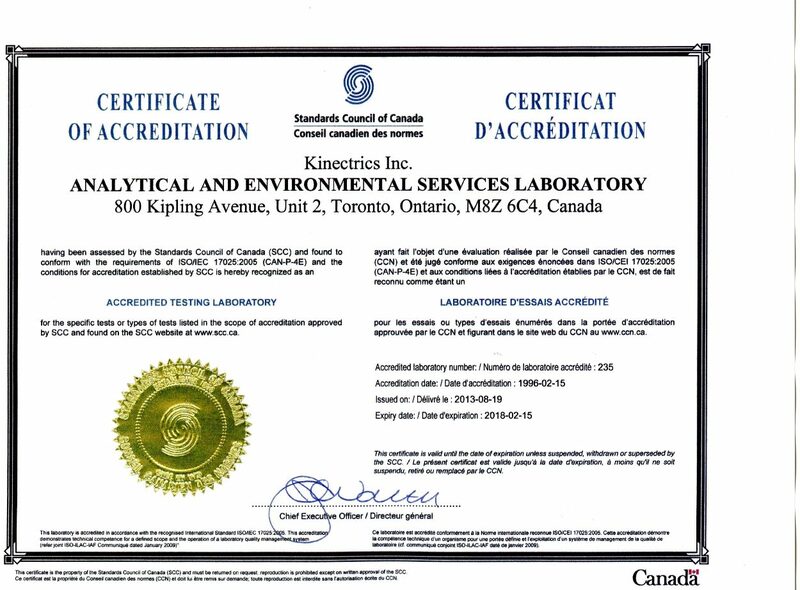 Kinectrics also maintains a QA Program that complies with ISO 17025:2017 for Analytical Chemistry Services, Electrical & Mechanical Testing, and Metrology, and the first two are accredited by the Standards Council of Canada (SCC).